Early American history includes many notable stories about Native Americans and their interactions with settlers. One of the most prevalent stories involves the young woman known as Pocahontas. Her interactions with English settlers set the stage for early relationships between the tribes living along the Virginia coast and the English settlers arriving in the area. While much of the legend surrounding her life may have been romanticized, factual evidence proves Pocahontas had significant influence on early relationships and how the English perceived Native Americans. 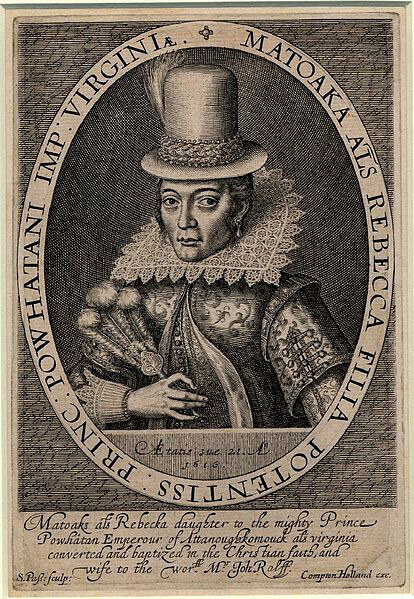 Pocahontas was the daughter of Chief Powhatan, leader of Tsenacommacah, which was a loose alliance of numerous tribes living in the Virginia Tidewater region. Her mother was a member of one of the tribes sent to Chief Powhatan as a wife. Following tradition, after the birth of Pocahontas, her mother returned to her tribe until she could later marry another. Pocahontas remained with her father’s tribe and likely had a typical Native American childhood. Most Algonquian-speaking tribes granted multiple personal names which could change throughout life and be used at different times depending on context. The secret name first granted to Pocahontas was Matoaka, later followed by Amonute. Pocahontas translates to “little wanton” and was likely a childhood nickname reflecting her nature. While referred to as a princess, Pocahontas was not royalty in the truest sense of the word. Accounts of her early life indicate she was a favorite of her father’s, yet she was not in line to inherit her father’s position in the hierarchy of the tribes. Pocahontas first appears in settler accounts in a letter from Captain John Smith who wrote of meeting her in 1608 as a ten-year-old girl. In this letter, he refers to a young Indian girl saving his life after he was captured by Opechancanough, a warrior believed to be related to Pocahontas. Early descriptions of his capture do not refer to her, but later letters written to Queen Anne include her in the narrative. The traditional story of his rescue by Pocahontas includes a description of how her father was poised to have him killed by clubs only to be stopped by Pocahontas risking her own life to save him. In this story, her intervention saved his life and convinced Chief Powhatan to return John Smith to Jamestown. Original accounts of the event do not refer to Pocahontas. Instead they describe a feast served by the tribes and a discussion with Indian leaders curious about the English settlers. Without strong evidence one way or the other, the truth of their first meeting remains uncertain. Facts do support the relationship between Pocahontas and the settlement at Jamestown. Accounts of her befriending colonists and playing with the children of the settlement exist and are believed to be true. In fact, her friendship saved the lives of several settlers during times of starvation. She brought food to the colony every few days, preventing the deaths of several colonists. Unfortunately, as the colonists expanded Jamestown, conflicts arose with the local tribes over the threat of losing their lands. In 1613, Pocahontas was captured by English settlers during the First Anglo-Powhatan War. 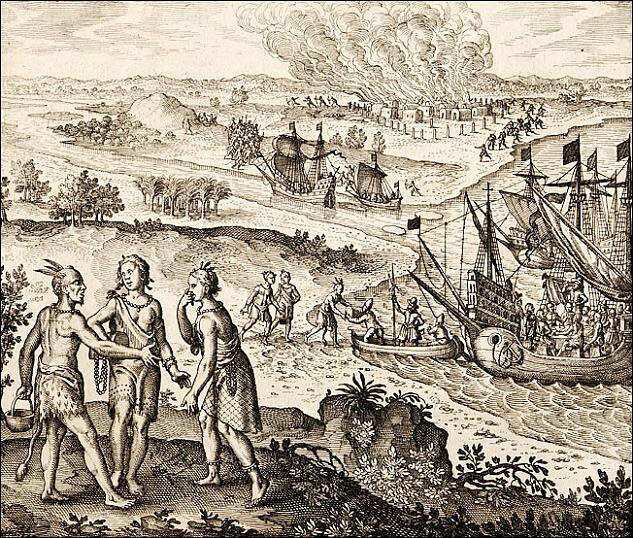 Beginning in the summer of 1609, this conflict between Jamestown settlers and local tribes spanned several years. Over the course of a few years, the settlers gained control of both the mouth and the falls of the James River in an attempt to expand their settlement. While conflicts occurred, Captain Samuel Argall pursued a peace agreement with the Patawomecks, a tribe living along the Potomac River who were not always loyal to Chief Powhatan and the alliance. During his talks with the Patawomecks, he learned that Pocahontas was visiting the village of Passapatanzy. With the help of an interpreter living with the Patawomecks, Argall pressured the local Indians into helping him capture Pocahontas. After being tricked into boarding Argall’s ship, Pocahontas was captured and held for ransom. The English demanded the release of English captives and the return of stolen tools and weapons. While Chief Powhatan released the captives, he did not return all of the stolen goods. As a result, Pocahontas remained in captivity while relations between the Indians and settlers continued to deteriorate. 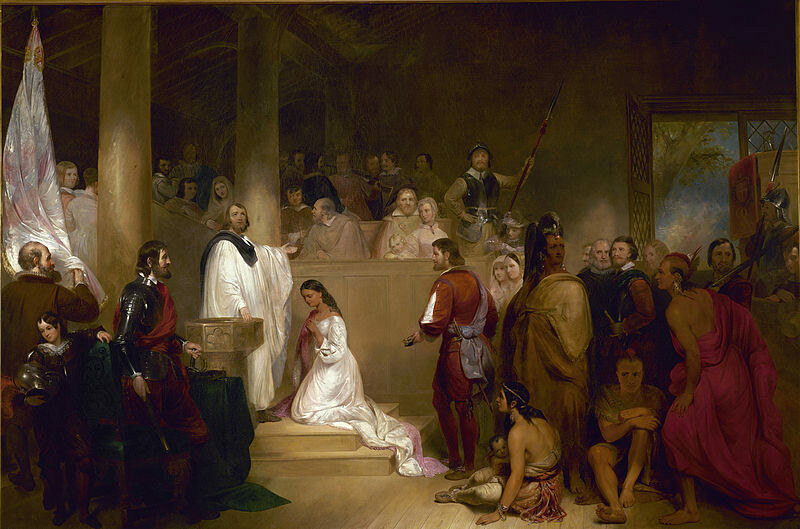 During her year-long captivity, Pocahontas was held at Henricus where she spent time with the local minister, Alexander Whitaker. Whitaker helped her improve her English and taught her about Christianity. While little is known about her time in captivity, she did convert to Christianity, taking the name Rebecca after her baptism. Her captivity came to an end during a confrontation between the English and Powhatan men on the Pamunkey River. During this confrontation, accounts tell of Pocahontas berating her father for valuing tools and weapons more than his daughter and that she would rather remain living with the English than return to her village. During her captivity, Pocahontas met an English widower, John Rolfe. Rolfe was a tobacco farmer spending a great deal of time with his crops and a new strain of tobacco he developed. He asked for and received permission to marry Pocahontas. The two were wed on April 5, 1614 and lived on his plantation for two years. The couple had a son, Thomas Rolfe, and the marriage calmed down relations between the Indians and the settlers. At the same time, the Virginia Company of London laid plans to take Pocahontas to England for a visit. One of the primary goals held by the company was the conversion of Indians to Christianity. As a converted Indian married to an Englishman, Pocahontas was considered a perfect example of the success of the Jamestown settlement. In June 1616, the Rolfes arrived in London where Pocahontas was presented to English society. While she was not technically royalty, the Virginia Company presented her as a princess in printed materials and engravings. Accounts refer to her being treated as royalty in many cases and she was even presented to King James. The Rolfes remained in England for over a year while she was entertained at various social functions. In March 1617, the Rolfes boarded a ship to return home to Jamestown. Unfortunately, Pocahontas became ill before the ship left the River Thames. After being taken to shore, she died shortly after in John Rolfe’s arms. The cause of her death is unknown but theories range from disease to poison. Pocahontas was buried beneath the chancel of Saint George’s church in Gravesend. Whether all of the details of her life are accurate or not, stories of Pocahontas provide a crucial chapter in early Colonial history. Her life and influence affected the settlement of Jamestown as well as early relationships between settlers and natives. Whether she was truly a heroic figure saving the life of John Smith or a simple Indian maiden, Pocahontas bound together the English and the Indians in many ways. Most of this is true but the rest is fake. how do you know that? no one is sure about Pocahontas and her life and death. i would like to know more about how she died. and i like to learn about her life in england a little more also. there’s alot of information on Pocahontas but i need more than her early life.I need verything that could be possible on what she did and how she died.who she married did she have children. and alot more. She was married to John Rolfe, an Englishman. They had a son named Thomas. She died when the family was traveling to Virginia from England. She was buried in Gravesend. hope this was helpful! i like how it tells u alot about her but i still need alot more information than u think.